Peanut butter and jelly. Gin and tonic. Peaches and cream. Some strange combinations make perfect sense paired, but how about the mouse and the PC gamepad? 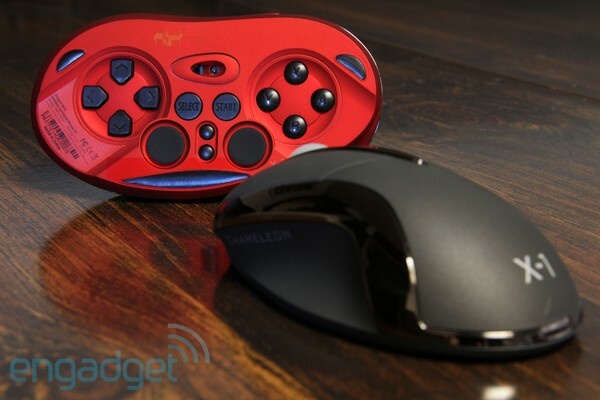 Those two items are what a Hong Kong peripheral manufacturer decided to combine, and the result was the Shogun Bros. Chameleon X-1 — a gaming mouse you can flip to find twelve buttons and two miniature analog sticks on the bottom. 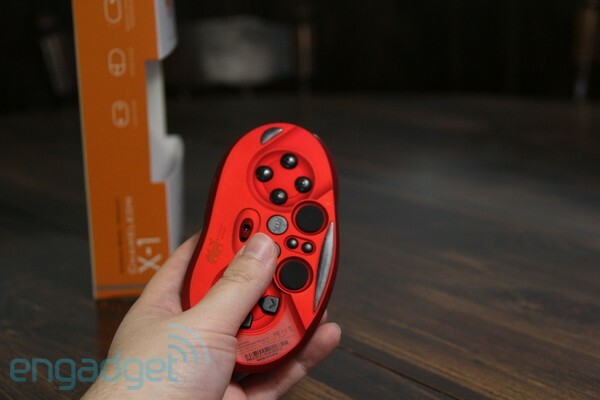 It works as a gamepad, sure enough, and functions as a one-handed multimedia remote too. But is it any good? We’ve used it as our primary peripheral for over a week, and after the break, we’ll tell you. 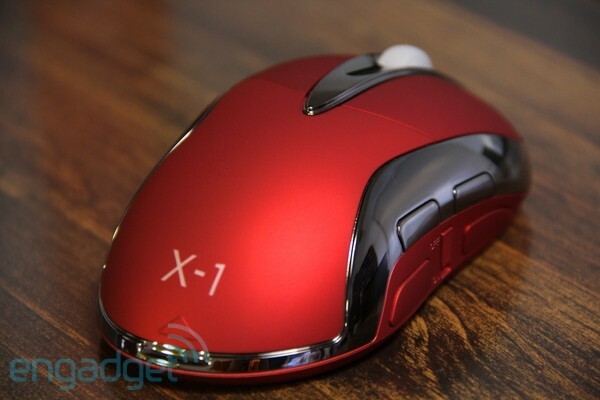 If the Chameleon X-1’s basic shape looks familiar, that’s probably because you’ve seen it before — it’s a dead ringer for the right-handed mouse design Logitech introduced in 2002, and could have nearly sprung straight from an MX518 mold. They say imitation is the sincerest form of flattery, though, and we don’t fault them one bit for it here, as the Logitech ergonomics are fantastic and dare we say it, the Shogun Bros. design looks and feels even better in the hand. 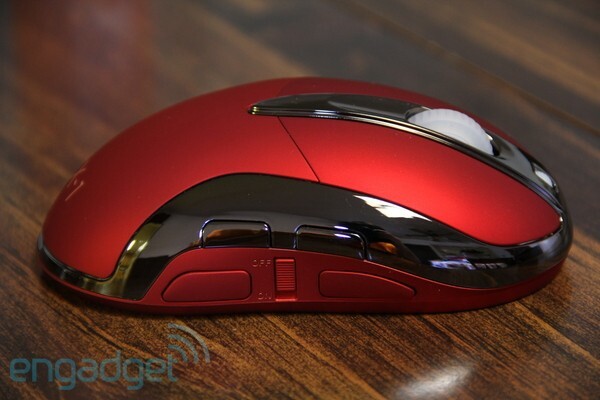 Silky soft-touch rubber covers the entire surface, excepting the chrome trim, leading to a firm, comfortable grip, which doesn’t attract dirt nearly as much as the glossy plastic buttons on earlier Logitech mice. What’s more, the ruby red version tested we tested has a bit of a pearlescent sheen — pretty attractive compared to the drab, or overly flashy machismo competition. Pull off the rear panel under that X-1 logo and more welcome surprises await: compartments for a single AA battery and the wireless USB dongle. 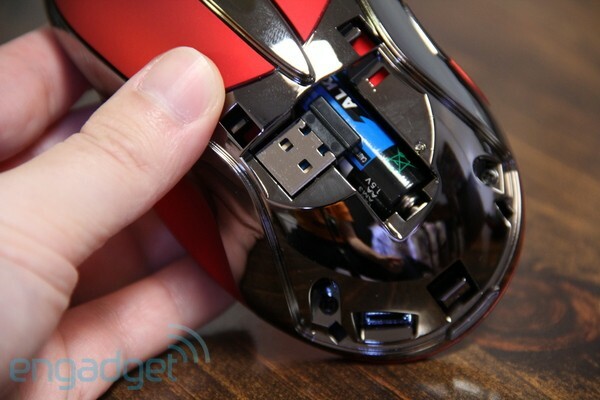 The mouse comes with an alkaline cell by default, but you can actually replace it with a rechargeable unit instead and even juice it up with a mini-USB port underneath the cover too — though we would have preferred the charge port at the front of the mouse, so you could play and charge simultaneously. Meanwhile, the 2.4GHz dongle is of the pleasantly tiny variety, and cleverly holds itself in place with a magnet — something we wish Shogun Bros. had done with the entire rear panel, to be frank, as every time we pried it off, it responded with a sickening crack. Unfortunately, Shogun Bros’ buttons and optical sensor leave much to be desired, both in terms of their responsiveness and placement — sure enough, the components feel very last-gen, and there are some awkward design decisions. The left and right mouse buttons click well enough, and the mouse wheel scrolls just fine, but all three of these feel a little shallow when pressed, compared to competing mice at this price. What’s worse, the other four buttons for mouse sensitivity and paging forwards and backwards have been relegated to the right pinky side, and in places where they’re not terribly easy to reach on the fly. This is obviously a concession for Shogun Bros’ gamepad mode, and we’ll get to that in a sec, but it’s good to note that they’re going to be pretty useless when mousing — and honestly they’re not very good buttons to begin with. 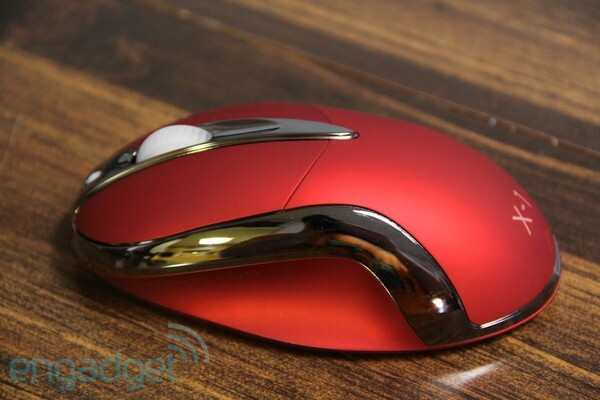 The 1600dpi optical sensor isn’t bad, and three PTFE feet propel the rodent across surfaces just fine, but there’s no comparison to that aforementioned Logitech MX518 in terms of accuracy. Spin that tiny transparent wheel up front to lock the mouse buttons in place, flip ‘er on her back, and hold down the Start button for three seconds to turn the Chameleon into a PC gamepad — albeit a fairly uncomfortable one to hold. Interestingly, it’s not the recessed thumbsticks and buttons that are a problem here, as most of them are actually fairly accessible; it’s just that the Logitech ergonomics that made for a good mouse didn’t leave many places for the rest of our fingers to go. The best we could do was curve our index fingers around the top edge to reach the shoulder buttons, middle fingers around back, and let the other four digits dangle. Not bad for short bursts of gameplay, but it got tiring after a while. We’ve already spoken to the shallow, cheap shoulder buttons back when they were on the pinky side of the mouse, but the rest of the Chameleon’s gamepad controls aren’t bad. The two analog nubs are oh-so-slightly convex for better grip, comfortable, and the four face buttons are middling but with a good amount of give. With these, we could throw our share of fireballs and shoryuken uppercuts in Street Fighter IV, and could toss out Super and Ultra Combos with ten minutes practice (not to mention plenty of experience doing the same on the Xbox 360 gamepad). We can’t say the same for the Chameleon’s D-pad, though, as it’s not a standard directional pad at all, just a series of four discrete buttons in that shape with no directional rockers to roll one’s thumbs across. We’ll also say that while the analog nubs were convenient for sweeping motions, they’re not terribly good for pinpoint control, as we found when painstakingly trying to level weapons at foes in shooting games. Unfortunately, getting to the level of game functionality we describe above is mildly annoying to begin with, because the Chameleon only supports the DirectInput controller scheme, not the newer XInput one, and has a non-standard button layout (X is Button 1 here, for instance) which can’t be reconfigured in hardware. What that means in plain English is that the X-1 won’t play nice with recent PC titles designed to use an Xbox 360 controller — though you can find a free XInput emulator if you know where to look — and you may have to change your key bindings in other games to comfortably play them as well. 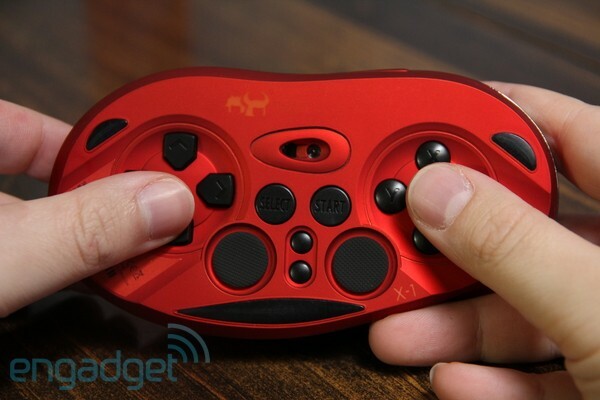 Though Shogun Bros. certainly plays up the gamepad angle, the wireless peripheral actually has a third function too — if you hold down the Select button for three seconds rather than Start, it becomes a fully-functional multimedia remote. You can pull up iTunes with a single press of the X button; change tracks, volume and mute; flip through documents with the shoulder keys a page or a line at a time; shut down or put the computer to sleep; or even — using one of the analog nubs and a pair of nearby buttons — emulate a slow-moving mouse pointer. While the latter was a little too lethargic to be much use on our 1080p screen, the remote came in handy when sick in bed, and the function works equally well with OS X.
Shogun Bros’ Chameleon X-1 combo mouse may look like a hundred bucks, but looks can be deceiving. The X-1 is a few design decisions and some circuitry short of what even entry-level gaming mice and gamepads can achieve individually. While we could see the all-in-one functionality appealing to travelers who want to pack a single device, the battery life just isn’t there — our pack-in alkaline lasted barely a week before the mouse sensor started puttering out, a travesty in an era where mice can squeeze out years. But you know what? It works, and we’re as gung-ho about the idea of combining a mouse and gamepad as ever, because the X-1 honestly comes within a (hefty) stone’s throw of something we’d highly recommend. We have the technology to build one better, stronger… more accurate. Here’s hoping a peripheral manufacturer sees the same potential.